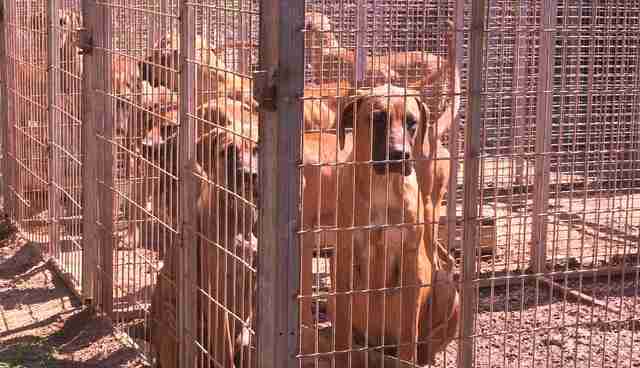 On Sep. 11, I was invited to document the closure of one of South Korea's dog meat farms. 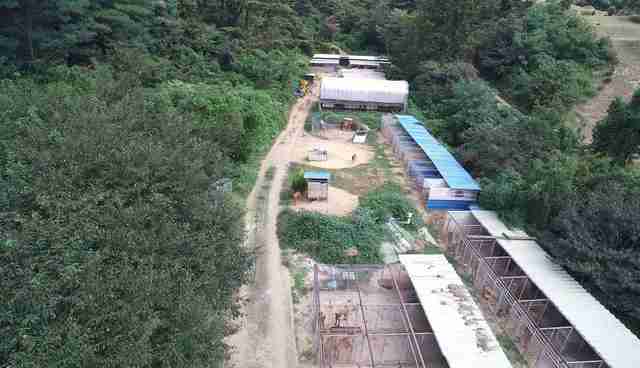 The Humane Society International had written an agreement and a contract with a farmer just outside the capital city of Seoul to close down his farm. The farm had just over 100 dogs that regularly supplied the traders in the busy markets of Moran. This farm was the second to be closed down since 2014 and the Humane society was helping the farmers make the transition from dog farming to growing crops. In August a team went to the farm to get all the dogs ready by inoculating and preparing relevant papers that would ship these dogs to the US to various shelters chosen by the Humane Society International for adoption. South Korea is the only country in the world known to commercially farm dogs to supply the demand for dog meat and associated products, and yet the trade is widely considered shameful and distasteful. There are many farmers that want to leave the industry due to bad karma concerns, family and societal shame about the practice or environmental fees related to the conditions on the farm. By working with these farmers who had expressed a desire to end their involvement in the industry, HSI were creating "models" that could be replicated throughout the country with the right governmental support. On the Sunday morning when I stepped off the bus and onto the farm for the first time, I could hear barking from many directions. There was a dog outside the office that was tethered to a wire cable that ran up and down a 10 foot run. This was the pet, she looked emaciated, her fur was in bad shape and she was covered in fleas. This prepared me to what I was about to witness. Walking up the dirt drive was another pet with a thick heavy chain tied to her collar that gave her about 6 feet of freedom. She was also emaciated and covered in fleas, she lived under a corrugated tin shelter that was full of her own feces, she was petrified and hid her face in the dirt as we walked on up to the farm. 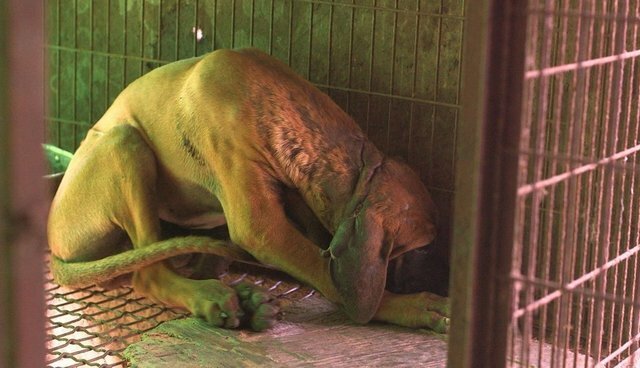 I saw the first row of cages with dogs jumping up and down barking and wagging their tails, they were all tan colored with darker muzzles, they looked a cross between a mastiff and a Rhodesian ridgeback dog, I was told that these were the typical meat dogs in South Korea and had no value as pets. I placed my hands on each cage and every dog tried to sniff and lick my hand. They were so beautiful and loving, many dogs snapped at each other wanting to get as much attention as possible for themselves. Large dogs and smaller dogs barked constantly, jumping up and down frantically. Behind these cages were more cages, all open aired and full of feces, their food bowls were empty and in the warm sunshine I noticed they had no water. Dog after dog after dog displayed the same actions, many uncontrollable. I could feel myself breaking inside and I teared up. I had to keep my composure as I was trying to film these beautiful animals so the world could see the conditions they were living in. I walked past a mincer with a huge bowl underneath it to catch the food that was prepared for all the animals. There were millions of flies and maggots crawling through whatever had been minced, the stench was horrendous. I covered my face as I approached the puppy enclosure that was under cover; female dogs and their young were in these raised metal wire cages that the dogs could barely stand in because of the gaps in the base. Each of the puppies would drop a leg through and stumble; there was no flooring to make a footing and as they grew older, their feet became deformed because they had to adapt to the conditions. Below the cages were piles of feces that dropped through the metal encrusted wire, old hypodermic needles and maggots were included. 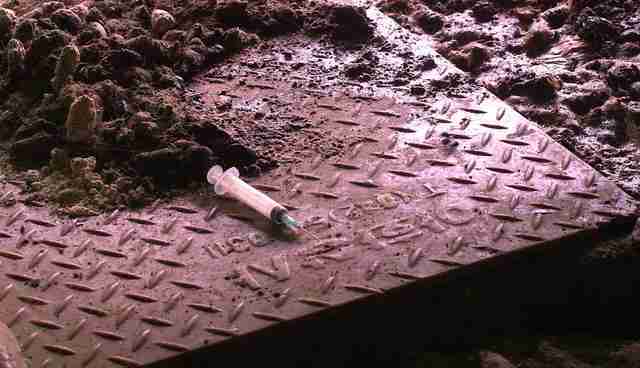 On top of the cages were bottles of drugs and used hypodermic needles that the farmer would inject into the dogs; I had no idea what was in these bottles, but they were not kept in a refrigerator. The female dogs barked, some growled to protect their puppies, others wagged their tails. I left the puppy enclosure and turned into a dark under-cover row of double raised cages that also had mountains of excrement. Here I found a dog completely huddled over, its spirit was broken, he would not look up at me and I spoke quietly telling him he would soon be safe and out of here. His neck had been stitched up with hessian string, probably out of an old potato bag and with no anesthetic. He trembled in the darkness. He had a small piece of hardboard that probably measured 18 inches in diameter, this was his only salvation from the hard wire-like base of the cage that had deformed his feet. He looked to be around 5 to 6 months old. I completely broke down and asked about the chances of taking him home with me. Lola Webber of Change for animals foundation, who was instrumental in engaging the HSI getting involved in closing down these farms, was there with me at this time and she told me my chances were probably 100 percent. I made up my mind right there that I would take this mentally and physically abused dog home with me, my job now was to sit and talk to him and make sure he was with loving caring people that only wanted to help him and his kind. The HSI had named him Sox because of the white markings on his feet but I decided to name him Pocket in honor of a friend's son I met in Nepal; my friend's tireless work helped close down the abusive Gadhimai festival. Day after day we arrived at the farm in the early hours to make crates and ship out the dogs; trained workers from the HSI carefully put each dog into carriers and placed them onto the truck that would take the dogs to the airport and on a plane to the US. By Monday, Sep. 21, we had put over 100 dogs onto planes destined to arrive in San Francisco and then onto various shelters to be assessed and vet checked. Pocket and five other dogs were sent up to Washington State, my wife and I drove down to Tacoma to pick up the dogs to bring them to PAWS in Lynnwood; all dogs including Pocket were put into kennels, fed and watered and settled in by PAWS staff. The next morning, my wife and I went back to PAWS to see Pocket. I got the slightest wag from his tail, he seemed to know who I was or at least I like to believe he did. After vet checked and neutering, we took Pocket home leaving the other dogs to be counseled and cared for, ready for adoption. I have visited these dogs daily and I will also follow their lives closely. Pocket had never seen the sunshine, never seen or touched grass, never smelt a flower, never seen a bird or a squirrel, he had never had a bowl of water in his young life. I could go on and on - Pocket's puppy years were taken from him. Pocket's life started on Saturday Sep. 26, 2015. I have created a Facebook page dedicated to his young life and other dogs in countries that use them for meat. It's called "Pocket for change." If you feel repulsed by the dog meat trade in South Korea, China, Vietnam or any other country that eats dogs, make sure you think about what you are about to say. To these countries it is no different than us eating pigs, chickens, cows. Consider a diet that does not include animals and then you may add validity to your argument about this cruel industry. I have not eaten an animal for over 30 years.